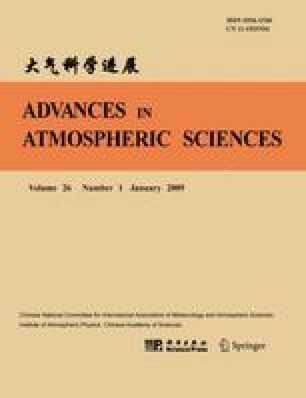 Annually averaged daily maximum and minimum surface temperatures from southeastern China were evaluated for artificial discontinuities using three different tests for undocumented changepoints. Changepoints in the time series were identified by comparing each target series to a reference calculated from values observed at a number of nearby stations. Under the assumption that no trend was present in the sequence of target-reference temperature differences, a changepoint was assigned to the target series when at least two of the three tests rejected the null hypothesis of no changepoint at approximately the same position in the difference series. Each target series then was adjusted using a procedure that accounts for discontinuities in average temperature values from nearby stations that otherwise could bias estimates of the magnitude of the target series step change. A spatial comparison of linear temperature trends in the adjusted annual temperature series suggests that major relative discontinuities were removed in the homogenization process. A greater number of relative change points were detected in annual average minimum than in average maximum temperature series. Some evidence is presented which suggests that minimum surface temperature fields may be more sensitive to changes in measurement practice than maximum temperature fields. In addition, given previous evidence of urban heat island (i.e., local) trends in this region, the assumption of no slope in a target-reference difference series is likely to be violated more frequently in minimum than in maximum temperature series. Consequently, there may be greater potential to confound trend and step changes in minimum temperature series.